Ok, so, remember those courting bugs from yesterday's post? Well this is one of those. I was playing around with 'super-macro', where you reverse the 50mm lens on the end of a regular macro lens (in this case my 300mm telephoto in macro mode). 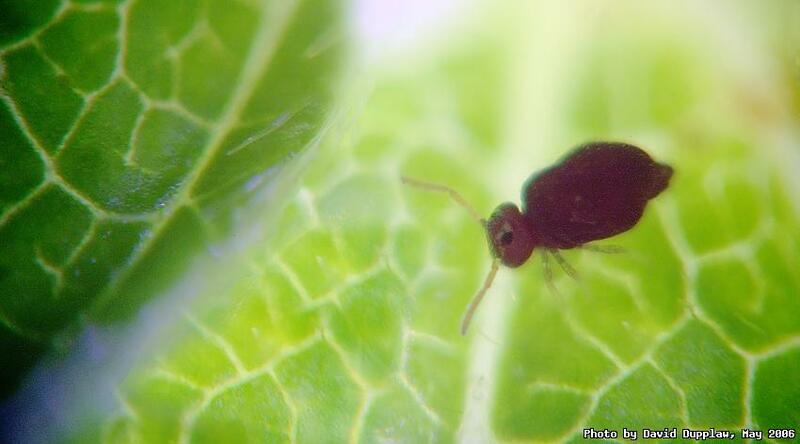 The bug is another Globular Springtail and is around about 0.5mm long. This isn't much of a crop and I was able to approximately work out (by considering the bug to be 0.5mm, and the sensor size 23.7mm) that this is about 1:14 (14x lifesize) magnification. This bug was incredibly small. My flash was on maximum power to light the scene, so there's some weird stuff going on in places, but I was just pleased to get the thing in focus; it was so dark in the viewfinder I was having trouble seeing anything, and the depth of field was all but nothing. Anyway, I might play with this super-macro a bit more, but I think I have proved to myself that it's not workable in the field - if only because working distance is.. well, inside the ring of my ring flash!